Plastic buttons of all types and of different qualities and prices, so you can find the ones that fit your project. A large majority of our buttons are made of plastic, so you will find many items in this category. Use the menus to narrow your search. Product Description: Buttons shaped as garden gloves. Content: 8 buttons in 4 different colors. Diameter: 27 mm. Material: Plastic. Product Description: Decorative buttons with shape of flowers in many colors and red ladybugs. Dress-It-Up Ref. : 5377. To be used in craft, scrapbooking, card making, patchwork and general sewing projects.Content: 6 buttons (3 flowers and 3 ladybugs)Dimensions: 37 mm (flowers) and 11 mm (ladybugs)Material: Plastic. 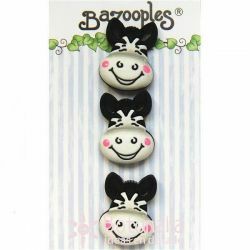 Product Description: Buttons shaped as monkey heads, with shank.Content: card with 3 buttons.Material: PlasticDiameter: 21 mmTo be used in all types of craft and sewing projects as well as children's clothing. Product Description: Buttons shaped as zebra heads, with shank. Content: card with 3 buttons. Material: Plastic Diameter: 23 mmTo be used in all types of craft and sewing projects as well as children's clothing. 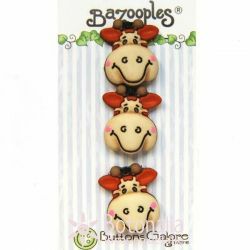 Product Description: Buttons shaped as giraffe heads, with shank.Content: card with 3 buttons.Material: PlasticDiameter: 24 mmTo be used in all types of craft and sewing projects as well as children's clothing. 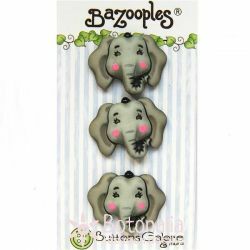 Product Description: Buttons shaped as elephant heads, with shank.Content: card with 3 buttons.Material: PlasticDiameter: 26 mmTo be used in all types of craft and sewing projects as well as children's clothing. Product Description: Decorative buttons with shapes of suns and moons with a children's touch. To be used in all types of craft and sewing projects as well as children's clothing. Content: Tarjeta de 6 botones (2 different models). Diameter: 23 mm approx. Material: Plastic. Product Description: Decorative button with the shape of a ladybug. To be used in craft, sewing, card making, patchwork and scrapbooking projects.Content: price is per unit.Diameter: approx. 14 mm.Material: Plastic. Product Description: Buttons with the shape of calcetín navideño. Dress-It-Up Ref. : 1185. To be used in craft, scrapbooking, card making, patchwork and general sewing projects.Content: 6 buttons of 3 different models.Diameter: 30 mm approx.Material: Plastic.